The author is a Dairy Development consultant in the Animal Production and Health Division, FAO, Rome, Italy. Les ressources en terre pour la production animale dont dispose la Jordanie étant limitées, tous les produits d'origine animale obtenus doivent être utilisés au maximum. Le Groupe de la production laitière de la Division de la production et de la santé animales, par l'intermédiaire du Programme de coopération technique de la FAO et en collaboration avec la Société coopérative jordanienne, a sensiblement stimulé la transformation du lait de brebis. Le projet TCP/JOR/6611 d'appui à la coopérative d'élevage ovin, financé essentiellement par le PAM, a fourni aux groupes de producteurs ruraux du matériel et une formation pour la transformation du lait. Les principaux produits obtenus étaient des fromages traditionnels très prisés sur le marché national. Les femmes étaient les principaux bénéficiaires du projet. Elles ont été formées à l'amélioration des pratiques de la traite, de la collecte, du stockage et du refroidissement, et employées comme opératrices des installations de transformation. Étant donné le bon fonctionnement des installations et la demande de produits, il est prévu d'étendre la gamme de ceux-ci aux yaourts, etc. Le projet a également éveillé l'intérêt de la région pour l'amélioration de la transformation du lait et un projet analogue sera bientôt mis en _uvre dans divers pays voisins. Jordania es una base de tierra pequeña para la producción animal. Por consiguiente, todos los productos animales obtenidos se deben aprovechar en la mayor medida posible. El Grupo de Producción Lechera de la Dirección de Producción y Sanidad Animal, por medio del Programa de cooperación técnica de la FAO y en colaboración con la Sociedad Cooperativa de Jordania, ha impulsado considerablemente la elaboración de leche de oveja. El apoyo al proyecto de cooperación para la producción ovina, TCP/JOR/6611, financiado en su mayor parte por el Programa mundial de alimentos, proporcionó a los grupos de productores rurales equipo y capacitación para la elaboración de la leche. Los principales productos obtenidos fueron quesos tradicionales, con un gran éxito en el mercado nacional. Las mujeres fueron las principales beneficiarias del proyecto. Se las capacitó en prácticas mejoradas de ordeño, recogida, almacenamiento y refrigeración y se las empleó como operadoras de las instalaciones de elaboración. Gracias a los buenos resultados de las instalaciones y la fuerte demanda, está prevista la ampliación de la gama de productos, para incluir yogures, etc. El proyecto también ha estimulado el interés por la elaboración mejorada de los productos lácteos y pronto se llevará a cabo un proyecto análogo en varios países de la región. The rural dairy sector in Jordan has recently received a significant boost from an FAO-led multi-donor supported project (TCP/JOR/6611) to assist sheep and goat milk production and the mechanization and standardization of traditional milk products such as Jameed, Samneh, Djamid and Jibneh, as well as a number of other cheeses. The project was operated from February 1996 to August 1998 at a total value of US$879 000. With the Dairy Group of the Animal Production and Health Division of FAO taking the lead technical role, other donors willingly gave their support to the project, which was mainly for the direct benefit of women through the provision of training in income- generating activities. The cooperatives also benefited from the increased return from the sheep and goat milk. The Jordan Cooperative Corporation (JCC) is now hoping to replicate the type of technology and expertise developed in a number of other regions in the country. The project stimulated a great deal of interest in small-scale dairy processing from individuals and producer groups both in the country and in the region as a whole. FAO. Provision of technical advice on the improved utilization of raw milk by establishing collection and processing centres, and training national counterparts, dairy staff and farm workers in improved hygiene and milk safety procedures for the production of safe and high quality traditional dairy products. 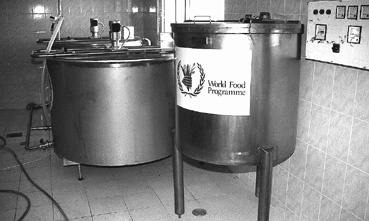 World Food Programme (WFP). Provision of funding for the purchase of machinery and equipment for the collection and production of sheep and goat milk in order to boost the incomes of local farmers. JCC and the Government of Jordan. Assistance to the livestock sector through the promotion of semi-industrial processing and the improvement of market access to rural producers. This will empower local communities, particularly women, stimulate the creation of job opportunities in rural areas and increase the quality and quantity of locally available traditional milk products. 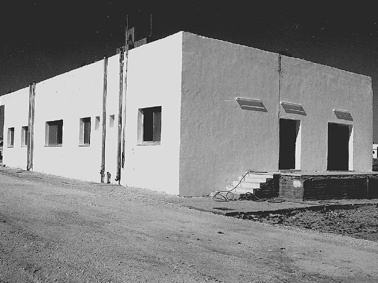 Jordan Sheep Cooperative Society. Establishment of three sustainable and commercially viable milk collection and processing centres, to assist in the commercialization and marketing of high quality dairy products designed to meet the needs of the national market and to provide a long-term income-generating activity for cooperative groups. German and Canadian Embassies in Jordan. Provision of two refrigerated vehicles for milk collection and product distribution. Jordan covers an area of 96 188 km2. Its terrain includes a variety of landscapes and climates. The eastern desert area is a plateau and hilly region running from north to south. To the west, the Great Rift Valley runs the entire length of the country and includes the Jordan Valley, the Dead Sea (at 400 m below sea level the lowest point on earth), the Wadi Araba and Aqaba area around the Gulf of Aqaba and the Red Sea. Jordan has a semi-arid climate with vast tracts of rocky deserts and sparse vegetation cover. A mere 4 percent of the land is arable; only 1 percent is meadow and pasture. In the rural areas, livestock breeding and rearing remain the traditional pastoralist system, with a large nomadic influence. Sheep flocks generally consist of 50 to 100 head, with a herder looking after the animals throughout the day. Animals are penned in at night close to camps or settlements. Jordan is a high net importer of basic foodstuffs and the consumer demand for livestock products continues to grow. Pastoralists and small farmers have been steadily increasing their sheep and goat numbers over the last ten years to meet this demand. From 1986 to 1996, the number of sheep and goats doubled to 2 375 000 and 806 000, respectively. Ovine and caprine milk accounts for 36 percent (58 600 tonnes) of total milk production. At the farm level, women are responsible for milking and the processing of milk and milk products, particularly in rural areas. Milking is mainly carried out at the watering holes/wells, close to accommodation. The ewes are attached head-on in a line, normally of 40 to 50 head, and hand-milked by the women. Each ewe produces 0.5 kg per day and the lactation period normally lasts 120 days. This gives an annual production of 60 kg per head, net of suckling requirements. With the high daily temperatures, milk spoils quickly; it is therefore essential to have it cooled and transported to the diary plant as soon as possible. Fixed times have been set for receiving raw milk at the dairy plants and the milk churns tagged for each producer. They are then washed at the plant before being collected by the producers. The main constraint for the full development of the sheep and goat sector identified by the JCC and the Government of Jordan was the lack of proper handling, storage and processing systems, particularly in remote rural areas where most flocks are raised. It was estimated that up to 20 percent of the raw sheep and goat milk is lost as a result of unhygienic practices and poor environmental conditions. It was also reported that up to 30 percent of the local sheep owners do not milk their ewes, owing to the lack of proper equipment and difficult market conditions. This results in significant losses, mainly to the producers (women and families), but also to the processing industry and, ultimately, to the consumers. In the 1980s, the Government of Jordan, in recognition of the above problems, set up various schemes, including the establishment of cooperative associations, provision of feed subsidies for improved animal nutrition and various rangeland developments to improve grazing capacity. However, the main difficulties in rural areas, such as lack of proper handling, storage, transportation and processing facilities, still posed a problem for the rural producers. Improved production and herd health are of little value when farmers cannot market their produce. The subsequent 50 percent reduction in feed subsidies also had a serious impact. Much of the consumer demand for livestock products is increasingly being met from the world market (e.g. as well as from live sheep from other countries in the Near East, Australia and New Zealand). It is therefore essential that the production capacity of sustainable sheep rearing in Jordan is fully utilized and more pressure put on the rural producer to produce dairy products tailored to meet national demands and suit consumer tastes. The optimum return from these products can be achieved through improved processing and value-addition, such as the manufacture of traditional cheeses. However, lack of technical knowledge, expertise and dairy processing equipment in many of the rural areas has severely hampered the setting up of efficient modern dairy processing. the Canadian and German Embassies in Jordan, who provided refrigerated vehicles for the transportation of milk and processed products. An international consultant recruited by FAO visited the country for 1.5 months in 1996 and 1997 to assess the constraints and opportunities in the sheep and goat dairy sector. In collaboration with WFP and the National Project Director, Dr Esam O. Al-Quararah, three cooperatives operating under WFP-funded rangeland development projects were selected to participate. The sheep-breeder cooperatives from the Karak, Maan and Dier-Alla regions were strategically selected from a total of 12 candidates. The sites and beneficiaries were selected according to milk production level, number and composition of flocks and availability of utilities such as power and water. JCC provided the necessary buildings. 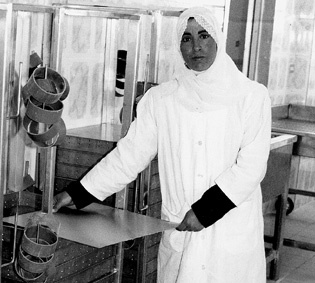 A local Jordanian dairy engineering company manufactured the processing equipment. The training element was one of the most important and successful results of the project. A basic assessment was made of the local situation from the farm to the table and the type of training tailored to suit the requirements. It was decided to construct processing facilities with a 100 percent future expansion potential to accommodate the growth envisaged in the sheep and goat milk sector. 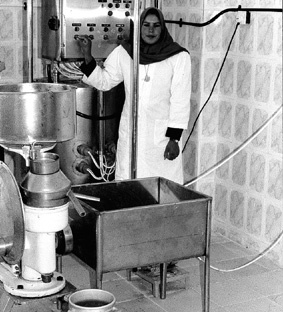 The facilities comprised two cheese processing plants with a capacity of 3 000 to 4 000 litres a day, located in Maan and Karak districts and managed and operated by the producer organization, and a specialized cheese factory with a capacity of 500 litres a day in Deir Alla, managed and operated by a local women's group. A total of 15 women were selected as trainees for the day-to-day operation of the plants and given one month's intensive training in plant operation, hygiene and management. The training also included equipment operation, maintenance, laboratory testing and preliminary process testing for traditional milk products. FAO also provided two JCC staff members with external training in Morocco to supply practical cooperative experience in improved and hygienic milk collection and processing systems. As mentioned earlier, poor handling practices at farm level are considered to be the main causes of raw milk quality deterioration in Jordan. Initially, it had been planned to hold a one-day intensive training course on improved milking practices, storage and transportation for about 200 women sheep farmers. Owing to high demand, however, over 400 women were trained. Additional training courses are planned for after the project is completed. It was decided that the processing plants should concentrate on traditional dairy products, since consumers were specific in their requirements. The introduction of additional products is being considered for the future and will be phased in over a number of production seasons. The quality of existing products was found to be very poor and the supply unreliable. A glut on the market occurs when the ewes' lactation period is at its annual peak, followed by scarce supply during the rest of the year. Product packaging was also identified as an area where substantial improvement could be made using nationally available materials and technology. Following the departure of the international consultant, the national project coordination unit took the initiative to hire a national dairy consultant, who worked closely with one of the counterpart staff to refine and finalize the production of the traditional-style products. One of the key factors for successful commercialization of the products was the evaluation of market opportunities for the processed products. Existing products on the market were evaluated for their production costs, distribution, consumer tastes and preferences. Detailed consumer preference testing also led to the development of an operational guideline manual for practical use by operators in the cooperatives. The products developed by the project were found to be of superior microbiological and taste quality. With the development of specialized in-county packaging, especially for Jameed, it was decided to market the processed products in the high-quality value-added sector. Market expansion and income growth in Jordan will ensure a growing market for these products. The project also provided two three-day workshops on accountancy and cash flow management for the administrative staff of the cooperatives. This ensures sustainable and controlled business practices, guaranteeing a fair and increased return to the producer, and optimizes marketing and distribution organization. By August 1998, two other sheep cooperatives had purchased sites for the construction of small-scale processing plants. They are currently seeking additional funding for seed capital. One example of highly successful technological development under the project was that of a cooling tank using nationally available materials and engineering experience. It consisted of a fibreglass tank holding up to six churns of 20-litre capacity fitted with a single-phase compressor maintaining the water at a temperature of 4 to 5°C. The unit is manufactured by a Jordanian company at a cost of US$2 570, which is only half the cost of imported ones. These units can be installed in multiples of 120 litres, depending on the quantity of milk being produced and stored. The unit was also adapted for use as refrigerated storage for extracted cream and pasteurized milk at the Deir Alla plant. Discussions are currently in progress on the contract processing of additional milk types, such as bovine milk, throughout the year by the existing milk plants, since they have a built-in excess capacity. Research and field trials have been initiated on the utilization of both bovine and camel milk, which in some regions is available in large quantities. Product marketing agreements have been signed between the dairy producing cooperatives and a number of consumer cooperatives throughout the country, providing for ongoing, guaranteed distribution on a large scale of these high-quality, safe, traditional products. Based on the commercial marketability and success in consumer acceptance of the traditional products, it has been proposed to expand the range and variety of products for the national market to cater for a variety of different consumer tastes and disposable incomes. Product types recommended for future production include yoghurt and labaneh among others. Jordan will also be participating in the Swedish- funded FAO Global Lactoperoxidase Programme. Under this programme, the FAO/World Health Organization (WHO)-approved lactoperoxidase milk preservation system will be demonstrated in 80 countries. The method and technology are specifically designed to enable milk producer groups to have increased market access through the prolongation of the shelf life of the raw milk to six to eight hours at 3oC. FAO envisages that this will have a significant impact on both the quantity and quality of the milk available to the consumer as fresh milk and for processing. In conclusion, FAO's Dairy Development Group believes that this type of project may be replicated in many other countries in the region. The Syrian Arab Republic has already requested FAO's assistance in the provision of technical advice for national implementation of a similar project. It is expected that non-governmental organizations (NGOs) and other development organizations, both national and international, will become involved in the promotion and funding of dairy processing activities based on this highly successful model. In the meantime the dairy producers and consumers in Jordan eagerly await the next milking season. Animal Production and Health Division, FAO, Rome, Italy. Jameed: a traditional dairy product which is a dried yoghurt produced from sheep and goat milk. Semneh: a traditional butter-based cooking oil made from sheep and goat milk. Djamid cheese: a traditional dried product found only in Jordan. Jibneh cheese: a traditional Jordanian cheese. The authors can be contacted at the Danish Centre for Experimental Parasitology, The Royal Veterinary and Agricultural University, Bülowsvej 13, 1870 Frederiksberg C, Copenhagen, Denmark. Cet article décrit les potentiels et les facteurs limitants en ce qui concerne une utilisation plus générale de la phytothérapie contre les helminthes du bétail et en médecine ethnovétérinaire en général. Certains inconvénients des produits manufacturés, tels que la résistance aux anthelminthiques et les résidus dans les aliments et l'environnement, ont récemment été reconnus. La phytothérapie traditionnelle offre une solution de rechange qui est moins coûteuse et plus respectueuse de l'environnement. Néanmoins, un des principaux inconvénients de la phytothérapie est l'absence de preuves scientifiques. Cet obstacle peut être surmonté à l'avenir grâce à l'organisation d'évaluations scientifiques. La culture organisée des plantes médicinales les plus prometteuses serait bénéfique à la fois pour les pays développés et pour les pays en développement. On trouvera une liste d'exemples de plantes dont on a indiqué ou démontré l'activité anthelminthique. En el presente artículo se exponen las posibilidades y las limitaciones de una mayor utilización de hierbas medicinales contra los helmintos en el ganado y la medicina etnoveterinaria en general. Últimamente se han reconocido ciertos inconvenientes de los productos manufacturados, como la resistencia antihelmíntica y los residuos en los alimentos y en el medio ambiente. Las hierbas medicinales tradicionales constituyen una alternativa, que es más económica y más favorable para el medio ambiente. Sin embargo, un inconveniente importante de las hierbas medicinales es la falta de pruebas científicas. Esto se puede superar en el futuro mediante evaluaciones científicas organizadas. El cultivo organizado de las plantas medicinales más prometedoras será beneficioso tanto para los países desarrollados como en desarrollo. Se enumeran ejemplos de plantas de las cuales se ha señalado o demostrado que tienen actividad antihelmíntica. Helminths are recognized as a major constraint to livestock production throughout the tropics and elsewhere (Waller, 1987; Ibrahim et al., 1984). Imported manufactured anthelmintics have long been considered the only effective way of controlling parasitic infection. However, as these are very expensive and often unavailable to farmers in rural areas, livestock producers have continued to use indigenous plants as dewormers, drawing upon centuries of knowledge of herbal medicine. Furthermore, some serious disadvantages of using manufactured drugs have become evident in the western world, such as drug resistance, food residues and environmental pollution. A general stagnation in the development of conventional medicine has led to an increased need for research into alternative therapeutic agents for the treatment and control of helminth infections. Knowledge about medicinal plants is not new to the western world; rather, it has been forgotten - 25 percent of all prescriptions dispensed in public pharmacies in the United States in 1973 contained drugs extracted from higher plants (Farnsworth and Morris, 1976). Similarly, some plants have been listed as anthelmintics in the British Veterinary Codex, at least until 1965. Extensive medicinal knowledge is to be found through research on the traditional use of herbal medicine, since an estimated 80 percent of the populations of developing countries depend on traditional medicines for primary health care (WHO, cited by Plotkin, 1992). The same figure seems to hold for livestock and ethnoveterinary care (McCorkle et al., 1996). It is considered that further research into this area will benefit both developed and less developed countries. This review presents some examples of herbal medicine used against helminths in livestock, and outlines potentials and limitations in the use of ethnomedicine, or ethnobotanical medicine - the utilization by humans of plants as medicines (Farnsworth, 1994). "Traditional" refers to the sum total of all non-mainstream medical practices, usually excluding so-called "western" medicine (Farnsworth, 1994). "Ethnoveterinary medicine" is defined as being the study of folk beliefs, knowledge, skills, methods and practices on the part of practitioners concerned with the health care of animals (McCorkle, 1989). WHY USE TRADITIONAL HERBAL MEDICINE? There is an increased awareness among medical and scientific communities that the importance of medicinal plant studies goes beyond mere anthropological curiosity. Plant anthelmintics have been in the forefront of this growing awareness (Hammond, Fielding and Bishop, 1997). A reason for this could be that they fall into the category of readily applicable elements of ethnoveterinary medicine in livestock development (McCorkle and Mathias-Mundy, 1992). Studying herbal medicine can serve to validate and enhance existing local uses and can give clues to remedies with further potential. There are, however, other reasons for continuing interest and research. First of all, locally produced plant anthelmintics are much cheaper than imported drugs. One striking example is a herbal wound powder in Sri Lanka, found to be as effective as an imported powder, which cost 80 to 90 percent less than the western equivalent (Anjaria, 1986). Logically, peasant farmers choose not to buy the western drugs and this may make availability a problem in rural areas, as a result of lower demand. Safe, efficacious and high-quality anthelmintic products are a normal requirement in many countries. Unfortunately, they are not always available. A recent investigation found plausible evidence of direct fraud with commercially available products. This led Monteiro et al. (1997) to compare the actual content of active drugs with the contents claimed on the labels of nine anthelmintic products sold in Kenya. They found that the actual levamisole concentration varied from 0 to 114 percent and that the concentration in different batches of the same product varied from 0 to 85 percent. These deviations could be owing either to incorrect storage or to deliberate fraud, such as dilution. The effect of a product with no active drug is the continued suffering of the animal and lower production. Use of anthelmintic products with inadequate amounts of the active ingredient will, in turn, encourage the development of anthelmintic resistance, since sub-optimal dosing selects for chemoresistant populations (Martin, 1990) and overdosing can result in residual amounts in the faeces, which may influence resistance further. Illiteracy or unfamiliarity with imported anthelmintics, resulting in incorrect usage, is also a problem leading to the same consequences. These constraints in the use of synthetic western anthelmintics in less developed countries underline the advantages of herbal remedies as an alternative treatment. They are cheaper and more reliable, they are known by the users and their supply is more sustainable. As they have undergone many years of clinical trials, most of them do not contain acutely toxic plants and do not produce serious unanticipated side-effects. Since they do not contain substances such as fixatives, preservatives or hormones, they are presumably more biodegradable and lead to less bioaccumulation in patients' bodies and the environment (McCorkle, 1995). Furthermore, it has been suggested that the diversity of herbal anthelmintics has precluded the occurrence of resistance despite many years of use, as discussed above (Hammond, Fielding and Bishop, 1997). Greater and more organized use of herbal medicine as a whole also supports the Convention on Biological Diversity, which at the June 1992 United Nations Conference on Environment and Development in Rio de Janeiro was signed by 154 countries (excluding the United States) and initiated in December 1993, after final ratification by 30 countries (Government of Denmark, 1996). The Convention aims at a commitment to cooperation between the contracting countries with regard to the conservation and sustainable use of the diversity of animals, plants and other living organisms and their habitats. Wider use of traditional herbal medicine can help fulfil these aims through the organized use of medicinal plants. Furthermore, the Convention seeks a reasonable division of the profit from the use of genetic resources. A country thus has a sovereign right over its resources (Government of Denmark, 1996, article 3) and is thereby assured of a monetary share in the possible marketing of a product from these natural resources. Organized cultivation of medicinal herbs and the creation of local trade and industry based on the herbal products can bring more jobs, income and status to rural inhabitants (McCorkle, 1995). Maintaining biodiversity in turn maintains the cultural diversity that is reflected in the people who administer the biodiverse habitats (Hyndman, 1994). These goals can be accomplished through ethnoveterinary research, development and extension (ERD&E / ER&D), which can be defined as "the holistic, interdisciplinary study of local knowledge and its associated skills, practices, beliefs, practitioners and social structures pertaining to the health care and healthful husbandry of food-, work- and other income-producing animals, always with an eye to practical development applications within livestock production and livelihood systems, and with the ultimate goal of increasing human well-being via increased benefits from stock raising" (McCorkle, 1995). The appreciation of traditional herbal medicine promoted by ER&D may lead to increased recognition of indigenous knowledge - the local knowledge unique to a given culture or society (Warren, 1995) - as a potential scientific resource. This may be regarded as one of the most important aspects of the re-emergence of herbal medicine. The case of ethnomedicine, human and veterinary, is not all straightforward. Because it is a very new area of academic study, many scientists and veterinarians still consider it pure superstition without a place in reality, the domain of "quacks" (Mesfin and Obsa, 1994). The main reason for this scepticism is basically a natural doubt about all that is alien and different, which all traditional methods must be to the western eye. Ethnomedicine does not follow western paradigms of scientific proof of efficacy, which might be one of the main arguments against the use of traditional medicine today (Sofowora, 1982). On the other hand, this may be one of the constraints that is easiest to reverse in the future, using organized investigative methods for scientific evaluation. Among the limitations of ethnoveterinary medicine, Mathias-Mundy and McCorkle (1989) mention "the inconvenience of preparing or using some remedies, the seasonal availability of certain plants, the scarcity of treatments against infectious epidemic diseases, the ineffectiveness of some treatments, the existence of harmful practices and the often inadequate ethno-diagnoses". The inconvenience of using some traditional remedies lies with the problems of collecting, preparing and administering the ingredients, which in some cases can be very time-consuming. Each constituent has to be found in special habitats and some ingredients might be seasonal. However, stock owners also have to go far to get imported medicine, which is currently the case in many rural areas in developing countries. The problem of time-consuming collection of some medicinal plants could be solved by organizing the most important of them into cultivation schemes. Seasonal availability, however, could not be overcome in this way, but developing proper storage techniques might be a solution. Inadequate ethnodiagnosis is probably the weakest aspect of traditional health care practice, owing to a lack of pathophysiological understanding (Schillhorn van Veen, 1997). The understanding of disease causality is rarely developed, and hence treatment and prevention can be inappropriate. Lack of sophisticated modern diagnostic technology for proper diagnosing is also a problem, even when the cause of disease is understood. For instance, helminths might only be recognized when they are of a size that makes them visible in faeces. Recognition of parasite eggs and small worms and differentiation between species is in some cases difficult without even a microscope. Differential diagnosis of helminth diseases from other conditions can also be a problem, since gross clinical signs such as weight loss, diarrhoea and anaemia could be caused by many ailments other than helminthosis. Poor diagnosis leads to some of the other constraints mentioned in the use of traditional medicine. Ineffectiveness of some treatments follows partly from poor diagnosis, leading to the application of inappropriate treatments. For instance, some plants only have a laxative effect and may expel only adult worms or parts of worms (Hammond, Fielding and Bishop, 1997). Furthermore, inadequate diagnosis or a lack of understanding of the disease can also lead to harmful prescriptions. In the case of a bacterial disease such as anthrax, which can be transmitted from animals to humans, the danger is not always known and the disease may be spread accidentally by the consumption of contaminated meat (Bizimana, 1994). Another human example (Bourke and Petana, 1994) was an African miner who complained of abdominal pain and nausea. He consulted a native medicine man, who advised that a mixture should be prepared from the segments of the worm (Taenia solium) the miner had brought with him. He drank the mixture and was subsequently hospitalized with epilepsy and muscular pain. X-rays of his body showed multiple cystercerci in the musculature. The liquid had probably contained thousands of ova, which resulted in this condition with cystercerci in the musculature and brain tissue. It shortly thereafter caused his death. Stories such as these understandably support the view of ethnomedicine as the domain of "quacks", not always without reason. Many traditional healers would never admit to a lack of knowledge. In some cases they would just order a remedy with no effects, or in the worst cases even harmful ones, in order to keep their reputation (Hammond, Fielding and Bishop, 1997) or simply to make money. However, the above example of the wrong treatment most probably does not originate from ill intentions or motives, but simply from a lack of understanding. Western science normally maintains a clear division between medicine and religion, so magico-religious practices are another cause of suspicion. In human ethnomedicine, as well as in ethnoveterinary medicine, magic and religion are integral parts of the whole (McCorkle, 1986) although Nwude and Ibrahim (1980) find the mystic rites that surround human traditional medicine virtually non-existent. Supernatural practices vary from simple recitations or incantations to complex ceremonies (Mathias-Mundy and McCorkle, 1989). Although such actions might have a psychosomatic effect in humans, their value in animals is uncertain. However, some factual knowledge with practical value may be hidden in magico-religious expressions. In ethnopharmacology, some remedies that were used for magic or symbolic purposes have been proved effective scientifically (McCorkle and Mathias-Mundy, 1992). Studying natural practices without the supernatural is hence "scientifically indefensible" (McCorkle and Mathias-Mundy, 1992). To use the words of Plotkin (1992), veterinary and human ethnomedicine stand at a crossroads. The decline and possible disappearance of all traditional practices lie in one direction, as traditional cultures come into contact with the western world. In the other far more desirable direction lie validation and improvement of ethnomedical knowledge. The collection and testing of natural products is one of two ways to discover pharmaceuticals; the other is laboratory synthesis (Soejarto, 1996). Different approaches can be used to collect products such as plants with anthelmintic properties. The biodiversity-based approach, also called the random collection and screening approach, involves the screening of a large set of diverse plant samples for one or more biological activities (Soejarto, 1996). The reservoir for discovery is almost inexhaustible, as it contains all plant species. However, this undoubtedly makes it the more expensive approach, considering the relatively low chances of discovery. A second approach is field observations for signs of interaction between organisms. This is based on the idea that plant secondary metabolites are a defence for the plant, acting against potential predators or pathogens such as viruses, bacteria, nematodes and others (Whitfield, 1995). A third approach arises from this, namely the selection of plants based on chemotaxonomy, since plant secondary metabolites are often species- or family-specific in their taxonomic distribution (Whitfield, 1995). Finally, the ethnobotanical approach and investigation of self-medicating behaviour in animals (Huffman, 1997) offer opportunities for the discovery of medicinal plants. The ethnobotanical approach assumes that the indigenous use of plants can give hints about their biological activities (Cox and Balick, 1994). A comparison with human ethnomedicine is important for the discovery of veterinary plant anthelmintics, because in many cultures healers of human diseases treat corresponding animal disorders with the same herbs, drugs, methods, etc. (Mathias-Mundy and McCorkle, 1989; Nwude and Ibrahim, 1980). The follow-up investigation of the ethnomedical uses of plants is widely accepted as the most productive plant surveying method, since 74 percent of all plant-derived drugs in clinical use worldwide have been discovered in this way (Farnsworth et al., 1985). Information on plants used medically can be obtained through literature search and analysis, and through field inquiries, although this makes it a very slow process. This is one of the limitations to this approach, and at the same time what constitutes its urgency. Rapid social and agricultural changes are taking place in many rural communities and therefore it is necessary to collect information on traditional patterns of use before these are disrupted. Many healers possessing information are elderly and lack successors and, as they die, their knowledge dies with them (Cox and Balick, 1994). However, reliance on healers' information might not be so important when collecting information on ethnoveterinary practices, because healers of human ailments keep their knowledge secret, while ethnoveterinary information circulates freely. Herders often possess knowledge of gross pathology through slaughtering, while human healers base their diagnoses solely on symptoms (Mathias-Mundy and McCorkle, 1989). Another constraint to the ethnobotanical approach is the limitation of indigenous plant use to certain recognized disorders which do not fully correspond to the diseases western medicine concentrates on. Indigenous plant remedies are more focused on gastro-intestinal complaints, inflammation, dermatological ailments and obstetric disorders (Cox and Balick, 1994), which in the case of discovering anthelmintic herbs must be considered significant. The most promising plants should be scientifically validated through systematic experiments, using indicator helminths in laboratory animals and toxicity studies and, if these are positive, screening in domestic animals (Hammond, 1997). In this way two plants, Embelia schimperi and Carica papaya, were found by the Danish Centre for Experimental Parasitology to be promising anthelmintic candidates (Bøgh, Andreassen and Lemmich, 1996; Satrija et al., 1994, 1995). For further examples see the Table. To ensure benefit to the inhabitants, the plants should, as far as possible, be cultivated and packaged locally and commercially marketed. The advantages of studying local knowledge of herbal medicine are numerous and most of them have already been outlined here. To sum up, it is important, in both a socio-economic and a scientific perspective, to draw upon the rich store of ethnomedicinal knowledge. 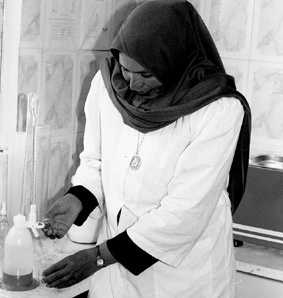 Herbal medicine is still used by the majority of humans on earth, mainly among populations in less developed countries. To these people, herbal medicines offer cheaper, more sustainable, available, reliable and familiar alternatives to imported synthetic drugs. Furthermore, when put into production locally, they can reinforce the income and status of local inhabitants. For both developed and less developed countries, the recognition and development of herbal medicine offers treatment methods that are more environmentally benign, since they tend to be less toxic, produce fewer unanticipated side-effects, are more biodegradable, accumulate no drug residues in meat or faeces and apparently do not trigger anthelmintic chemoresistance. However, there are problems connected with the use of herbal medicine, the largest being the lack of scientific evaluation. Such evaluation is the most important step once information about indigenous uses of medicinal plants has been collected. The most effective approach to obtaining such knowledge is the ethnobotanical approach, which assumes that indigenous uses of plants indicate the presence of biologically active constituents in the plants. This is a slow but very urgent process, as young people desert the traditional knowledge and lifestyles of their elders, leading to the possible disappearance of this knowledge. Comparison with human ethnomedicine is also important when looking for plants against ailments of livestock, since healers often use the same medications for similar animal diseases. Finally, ER&D offers a way to obtain ethnoveterinary practices as it seeks sustainable development through appreciating and building upon local knowledge of veterinary and husbandry practices. In this way, herbal medicine may very well become a pioneer in turning local knowledge into global knowledge, through the recognition of local knowledge as an indispensable source of sustainable development for both people and the environment all over the world. This of course does not mean that traditional medicine should take over western medicine, but rather that we may benefit from a harmonious balance of both. Adewunmi, C.O. & Akubue, P.I. 1981. Preliminary studies on the anthelmintic properties of the aqueous extract of Callindra portoricensis. (Jacq.) Benth. Bulletin of Animal Health and Production in Africa, 29(2): 171-5. Akhtar, M.S. & Ahmad, I. 1991. Evaluation of antinematodal efficacy of tetrahydroharmine in goats. Veterinarski Arhiv., 6(5): 307-11. Akhtar, M.S. & Ahmad, I. 1992. Comparative efficacy of Mallotus philippinensis fruit (Kamala) or Nilzan R drug against gastrointestinal cestodes in Beetal goats. Small Ruminant Research, 8(1-2): 121-8. Akhtar, M.S., Chattha, M.I. & Chaudry, A.H. 1982. Comparative efficacy of santonin and piperazine against Neoascaris vitulorum in buffalo calves. Journal of Veterinary Pharmacology and Therapeutics, 5(1): 71-6. Akhtar, M.S., Javed, I., Hayat, C.S. & Shah, B.H. 1985. Efficacy and safety of Caesalpina crista Linn. Seeds, its extracts in water and methanol against natural Neoascaris vitulorum infection in buffalo calves. Pakistan Veterinary Journal, 5: 192-6. Akhtar, M.S.& Riffat, S. 1984. Efficacy of Melia azedarach Linn. fruit (Bahain) and Morantel against naturally acquired gastrointestinal nematodes in goats. Pakistan Veterinary Journal, 4: 176-9. Akhtar, M.S. & Riffat, S. 1985. Evaluation of Melia azedarach Linn. fruit (Bahain) against Ascaridia galli infections in chickens. Pakistan Veterinary Journal, 5: 34-7. Akhtar, M.S. & Riffat, S. 1986. A field trial of Peganum harmala Linn. seeds (harmal) against natural cestodal infection in beetal goats. Journal of Pharmacology (Univ. Karachi), 4: 79-84. Anjaria, J.V. 1986. Traditional (indigenous) Veterinary Medicine Project. Final report. Livestock Development Project, Sri Lanka Asian Development Bank. Gannoruwa, Peradeniya, Sri Lanka, Veterinary Research Institute. Bizimana, N. 1994. Epidemiology, surveillance and control of some of the principal infectious animal diseases in Africa. Revue Scientific et Technique, Office International des Épizooties, 13(2): 397-416. Bories, C., Loiseau, L., Cortes, D., Myint, S.H., Hoquemiller, R., Gayral, P., Cave, A. & Laurens, A. 1991. Antiparasitic activity of Annona muricata and Annona cheromolia seeds. Planta Medica, 54: 434-6. Bourke, G.J. & Petana, W.B. 1994. Human Taenia cysticercosis: a bizarre mode of transmission. Transactions of the Royal Society of Tropical Medicine and Hygiene, 88: 680. Bøgh, H.O., Andreassen, J. & Lemmich, J. 1996. Anthelmintic usage of extracts of Embelia schimperi from Tanzania. Journal of Ethnopharmacology, 50: 35-42. Chakraborty, B., Ray, N.M. & Sidkar, S. 1979. Study of anthelmintic property of Tribulus terrestris Linn. Indian Journal of Animal Health, 1: 23-5. Cox, P.A. & Balick, M.J. 1994. The ethnobotanical approach to drug discovery. Scientific American, June, 60-65. Dubey, M.P. & Gupta, I. 1969. Anthelmintic activity of Alangium lamarckii. Indian Journal of Physiology and Pharmacology, 12: 35-6. Farnsworth, N.R. 1994. Ethnopharmacology and drug development. In Ethnobotany and the search for new drugs (Ciba Foundation Symposium 185), p. 42-59. Chichester, UK, John Wiley and Sons. Farnsworth, N.R., Akerele, O., Bingel, A.S., Soejarto, D.D. & Guo, Z. 1985. Medicinal plants in therapy. Bulletin WHO, 63(6): 965-81. Farnsworth, N.R. & Morris, R.N. 1976. Higher plants - the sleeping giant of drug industry. American Journal of Pharmacy, 148(2): 46-52. Fernandez, T.J. 1991. Local plants having anthelmintic activity. ASEAN J. Sci. Technol. Develop., 8(2): 115-19. Government of Denmark. 1996. Convention on Biological Diversity. Rio de Janeiro, June 5 1992. Danish Ministry of Foreign Affairs, Environmental Department, J.nr. 46.B.88. Hammond, J.A., Fielding, D. & Bishop, S.C. 1997. Prospects for plant anthelmintics in tropical veterinary medicine. Veterinary Research Communication, 21(3): 13-28. Huffman, M.A. 1997. Current evidence for self-medication in primates: a multidisciplinary perspective. Yearbook of Physical Anthropology, 40: 171-200. Hyndman, D. 1994. Conservation through self-determination: promoting the interdependence of cultural and biological diversity. Human Organization, 53(3): 296-302. Ibrahim, M.A., Nwude, N., Ogunsusi, R.A. & Aliu, Y.O. 1984. Screening West African plants for anthelmintic activity. ILCA Bulletin, 17: 19-23. ITDG & IIRR. 1996. Ethnoveterinary medicine in Kenya: a field manual of traditional animal health care practices. Nairobi, Intermediate Technology Development Group and International Institute of Rural Reconstruction. Lal, J., Chandra, S., Raviprakash, V. & Sabir, M. 1976. In vitro anthelmintic action of some indigenous medicinal plants on Ascaridia galli worms. Indian Journal of Physiology and Pharmacology, 20: 64-8. Martin, P.J. 1990. In Boray, J.C., Martin, P.J., Roush, R.T., eds. Resistance of parasites to antiparasitic drugs. p. 129. Rahway. NJ, USA, MSD AGVET. Mathias-Mundy, E. & McCorkle, C.M. 1989. Ethnoveterinary medicine: an annotated bibliography. Bibliographies in Technology and Social Change, 6. McCorkle, C.M. 1986. Intro to ER&D. Journal of Ethnobiology, 6(1): 129-49. McCorkle, C.M. 1989. Veterinary anthropology. Human Organization, 48(2): 56-62. McCorkle, C.M. 1995. Back to the future: lessons from ethnoveterinary RD and E for studying and applying local knowledge. Agriculture and Human Values, 12(2): 52-81. McCorkle, C.M. & Mathias-Mundy, E. 1992. Ethnoveterinary medicine in Africa. Africa International African Institute, 62(1): 59-93. McCorkle, C.M., Mathias-Mundy, E. & Schillhorn van Veen, T.W. 1996. Ethnoveterinary Research and Development. London, Intermediate Technology Publications. Mesfin, T. & Obsa, T. 1994. Ethiopian traditional veterinary practices and their possible contribution to animal production and management. Revue Scientific et Technique, Office International des Épizooties, 13: 417-24. Metha, R.K. & Parashar, G.C. 1966. Effect of Butea frondosa, Vernonia anthelmintica, and Carica Papaya against Oxyurids in mice. Indian Veterinary Journal, 43: 73-8. Minja, M.M.J. 1989. Collection of Tanzanian medicinal plants for biological activity studies. In Proceedings of the 7th Tanzania Veterinary Association Scientific Conference, Arusha, 7: 67-78. Monteiro, A.M., Wanyangu, S.W., Kariuki, D.P., Bain, R., Jackson, F. & McKellar, Q.A. 1997. Pharmaceutical quality of anthelmintics sold in Kenya. Veterinary Record, 142 (15): 396-398. Mursof, E.P. & He, S. 1991. A potential role of Papaya latex as an anthelmintic against patent Ascaridia galli in chicken. Heamara Zoa, 74: 1-5. Nwude, N. & Ibrahim, M.A. 1980. Plants used in traditional veterinary medical practice in Nigeria. Journal Veterinary Pharmacology and Therapeutics, 3(4): 261-73. Padmaja, V., Thankamany, V. & Hisham, A. 1993. Antibacterial, antifungal and anthelmintic activities of root barks of Uvaria hookeri and Uvaria narum. Journal of Ethnopharmacology, 40(3): 181-6. Perrett, S. & Whitfield, P.J. 1995. Atanine (3-dimethylallyl-4-methoxy-2-quinolone), an alkaloid with anthelmintic activity from the Chinese plant Evodia rutaecarpa. Letter, Planta Medica, 61(3): 276-8. Plotkin, M.J. 1992. Ethnomedicine: past, present and future. In Natural resources and human health: plants of medicinal and nutritional value. Proceedings, p.79-86. Amsterdam, the Netherlands, Elsevier. Rebrassier, R.E. 1934. Pyrethrum as an anthelmintic for Ascaridia lineata. Journal of the American Veterinary Medical Association, 84: 645-8. Roepke, D.A. 1996. Traditional and re-applied veterinary medicine in East Africa. In McCorkle, C.M., Mathias, E., Schillhorn van Veen, T.W., eds Ethnoveterinary research and development. London, Intermediate Technology Publications. Satrija, F., Nansen, P., Bjørn, H., Murtini, S. & He, S. 1994. Effect of papaya latex against Ascaris suum in naturally infected pigs. Journal of Helminthology, 68: 343-6. Satrija, F., Nansen, P., Murtini, S. & He, S. 1995. Anthelmintic activity of papaya latex against patent Heligmosomoides polygyrus infections in mice. Journal of Ethnopharmacology, 48: 161-4. Schillhorn van Veen, T.W. 1997. Sense or nonsense? Traditional methods of animal parasitic disease control. Veterinary Parasitology, 71: 177-94. Sen, H.G., Joshi, B.S., Parthasarathy, P.C. & Kamat, V.N. 1974. Anthelmintic efficacy of Diospyrol and its derivatives. Arzneimittel Forschung, 24(12): 2000-3. Sharma, P.K. & Singh, V. 1989. Ethnobotanical studies in Northwest and Trans-Himalaya. Ethnoveterinary medicinal plants used in Jammu and Kashmir, India. Journal of Ethnopharmacology, 27(1-2): 63-70. Sherif, A., Hall, R.G. & el-Amamy, M. 1987. Drugs, insecticides and other agents from Artemisia. Medical Hypotheses, 23(2): 187-93. Soejarto, D.D. 1996. Biodiversity prospecting and benefit sharing: perspectives from the field. Journal of Ethnopharmacology, 51(1-3): 1-15. Sofowora, A. 1982. Medicinal plants and traditional medicine in Africa. Chichester, UK, John Wiley and Sons. Waller, P.J. 1987. Anthelmintic resistance and the future for roundworm control. Veterinary Parasitology, 25(2): 177-91. Warren, D.M. 1995. The cultural dimension of development: indigenous knowledge systems. London, Intermediate Technology Publications. Whitfield, P.J. 1995. Plant allochemicals and the control of parasites. Bulletin of the Scandinavian Society for Parasitology, 5(2): 5-18.